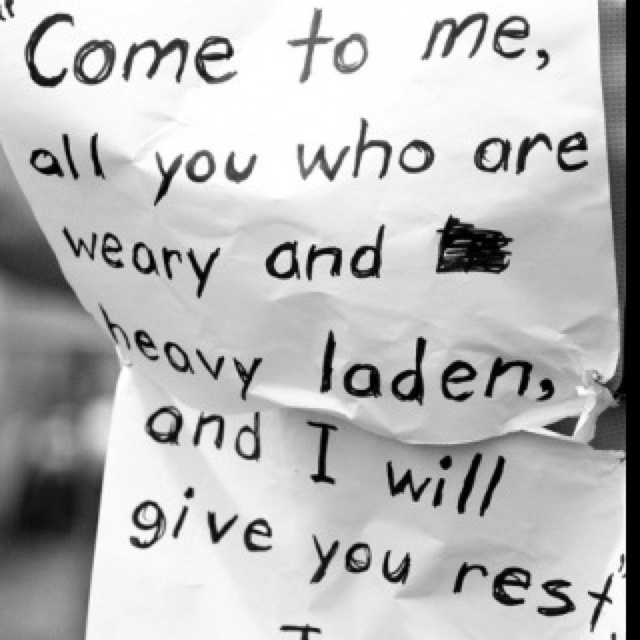 All Who Are Weary Come And Find Rest!! Have you ever gone on a walk or a hike? You start out so energetic, excited, your pace is quick, your legs are strong, you feel great. As you continue to walk, you come upon a part of the trail where the terrain starts to becomes rocky. You notice that the trail begins to turn into an upward incline. It becomes harder to breathe. You realize that you must focus more on where you place your feet so that you do not slip. Tiredness and thirst begins to take over. Then, you start to get a pain in your side, your legs begin to hurt and you feel as if you don’t want to take another step. You want to quit instead of continuing on to where the view is clear and the air is fresh. The destination you have so longed to reach suddenly seems unrealistic. Questions start to rise in your mind. Do you give up and choose to walk away from what you know would bring you fulfillment? Or do you finish what you have started? This is what is called weariness. The meaning of the word weary is to be exhausted in strength, endurance, vigor, or freshness. I would like to talk to you today about the weariness of life. Have you ever heard the phrase “life is a bed of roses?” It means that life is always easy and pleasant. But the truth is, that the path of life isn’t always easy. There are times when you think that you have it all figured out and suddenly there is an unexpected twist in the road. It’s in those times that discouragement can easily settle in. For instance, have you ever been waiting on a promise from God? He tells you something that He wants to do in your life and doesn’t always tell you how you will get there. He leads you one step at a time. You have it all planned out in your mind on how He is going to do it and then He doesn’t do it the way that you thought that He would. At times, it looks as if nothing is happening at all and you begin to doubt if God is really going to come through. This is a season that I have been walking through. It hasn’t been easy. I have been challenged with being faithful even when it gets lonely, highly uncomfortable, confusing and feels like nothing is happening. I have had times where I have felt worn out by it all, times where my heart felt crushed, battered, bruised, and even weary. I don’t think that I can even begin to tell you how many times I have had the temptation to give up, throw in the towel and walk away. In the moments when I have felt at my wits end and didn’t know what to do. I would come to God and He would fill me with His comfort, love, reassurance and most of all His rest. I don’t have to know all the answers I just have to be in the presence of the One who does know all the answers. Recently, God showed me something that was so encouraging. In the book of Genesis it talks about Joseph who had some dreams that one day he would rule over his family. Little did he know that he would be betrayed by his own brothers and sold into slavery. He didn’t know that Potipher’s wife would accuse him and have him thrown into prison for what could seem to be the rest of his life. Joseph had every reason to believe that he would not fulfill what God said he would. He also had every reason to quit, no longer serve God, deny Him and die. But, he chose to continue to honor God, to obey him and to do the things asked of him. He did them with the utmost excellence by being a servant to those over him and helping those in need. How did he do it? In Genesis 39:2 it says, But the Lord was with Joseph, and he [though a slave] was a successful and prosperous man; and he was in the house of his master the Egyptian. Then in Genesis 39:21 it says, But the Lord was with Joseph, and showed him mercy and loving-kindness and gave him favor in the sight of the warden of the prison. Even when Joseph went through hard times the Lord was with him. He saw all that was happening and was watching over him and taking care of him while he was moving toward the destination that God had for him. He gave him the strength to walk through it. You will see Joseph’s end result found in Genesis 50:18-20 it says this, Then his brothers went and fell down before him, saying, See, we are your servants (your slaves)! And Joseph said to them, Fear not; for am I in the place of God? [Vengeance is His, not mine.] As for you, you thought evil against me, but God meant it for good, to bring about that many people should be kept alive, as they are this day. As Joseph yielded to God and surrendered himself to God, even to the point of pain, God not only kept his promise but, He also saved many other lives because of Joseph’s choice. When you look at the rest of Joseph’s life, you will see that he had more than enough finances, food, land, blessing and favor on his life all because he yielded himself to the plan of God and obeyed Him no matter what it cost him. Has this season of my life been difficult? Yes. But, even in the midst of it there has been a sweetness. God has brought me closer to Him. His presence, love, grace, hope and strength is what has been sustaining me. I know that as I trust Him, He will take me to the place of fulfillment. “Can a woman forget her baby? Can she forget the child who came from her body? Even if she can forget her children, I cannot forget you. I drew a picture of you on my hand. You are always before my eyes. I am here to say that God has not forgotten you. God is watching over every moment of your life. Allow Him to continue His work in you, lead you and guide you as you obey Him and recognize that He is with you during this season. It won’t be long and you will be in the place that He has so longed to take you. It will not only be a blessing to you but it will also be a blessing and a testimony to those around you of His faithfulness and goodness toward those He loves. When you feel yourself becoming weary and want to give up, go to Him and let Him give you the rest and strength that you need. Isaiah 40 says, God doesn’t come and go. God lasts. He’s Creator of all you can see or imagine He doesn’t get tired out, doesn’t pause to catch his breath. And he knows everything, inside and out. He energizes those who get tired, gives fresh strength to dropouts. For even young people tire and drop out, young folk in their prime stumble and fall. But those who wait upon God get fresh strength. They spread their wings and soar like eagles, they run and don’t get tired, they walk and don’t lag behind. Let Him help you in the times that it gets difficult. Draw from His strength and let Him carry you through to the end. How? By resting in Him. Fixing your eyes on Him alone. Worshipping Him and waiting on Him even in the difficult seasons. James 4 says, Draw near to God and He will draw near to you. As you do, His presence will fill you to overflowing and you will have the strength to walk through it. Know that you are not alone. God is with you. You can trust and rest in Him while you are on the journey of life.